A next-generation robotic arm with finer dexterity and lighter materials will be required for planned exploration missions to deep space, asteroids and Mars, according to Canadian officials who unveiled new robotics concepts last week. Made of lightweight composite materials, the next-generation Canadarm will be able to fit inside a minivan, according to Canadian space officials. 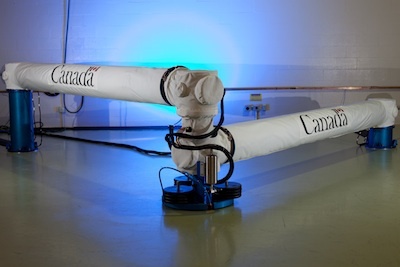 The Canadian Space Agency showed off prototypes of future robotic arms Sept. 27. The concepts were developed over three years with $53 million in funding from a 2009 economic stimulus package passed by the Canadian government. MDA Corp. built a 49-foot prototype telescoping arm for use in human spaceflight and a smaller 8.4-foot arm with the ability to refuel satellites and repair components in space. The large, telescoping arm can be stowed to fit on commercial spaceships and NASA's Orion crew capsule, according to Gilles Leclerc, the Canadian Space Agency's director-general for space exploration. According to Leclerc, the arm could be used to assemble habitats in deep space or help astronauts exploring destinations such as asteroids. The smaller arm would build on technology on Canada's Dextre robot, a two-armed device used to install experiments, work on electronics, and demonstrate satellite refueling procedures outside the International Space Station. NASA and CSA have not agreed on what role Canadian robotics will have on future exploration missions, but top officials in both agencies have discussed collaboration, Leclerc said in an interview with Spaceflight Now. "Regardless of future space destinations, space robotics will be required for a variety of missions, from rovers that act as robotic planetary explorers to robots that will repair and refuel satellites and space telescopes," Leclerc said. "No matter the mission, Canada will be ready." Canada provided robot arms - or Canadarms - to fly on the space shuttle, and a 58-foot manipulator named Canadarm 2 is on the space station with the Dextre robot. "Like all Canadians, I am proud of the iconic Canadarm, that served the space shuttle program for three decades, as well as the next-generation Canadarm, which will further Canada's legacy of excellence in space robotics," said Gary Goodyear, Canada's minister of state for science and technology. The Canadian government also earmarked 2009 stimulus funds to develop rover technology to be used on the moon and Mars, according to Leclerc.